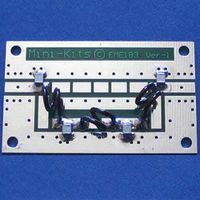 Minikits in Australia make a really good low pass filter which is ideal for use with the Portsdown or other 70cms DATV transmitters. As used by G4KLB, G8VPG and others. Paul Wade W1GHZ has published combline filter designs in tinplate and Hammond boxes. THe 432MHz design uses a 1590BB size box. These are more easily tunable than the Altoids tin filter by using 3 air trimmer capacitors. 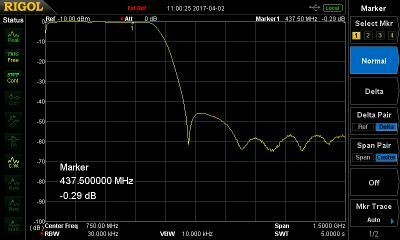 Tuneable passband filter design by Ian, G3KKD, with 2 MHz band pass and 30 dB attenuation 4 MHz away. (the full article is available in CQ-TV 228). This makes it suitable for use between the ADF4351 synthesiser and the Portsdown modulator to improve the constellation as well as the output of a driver stage up to about 1 watt. It would also be very useful to reduce overload from phone towers or broadcast TV if place in front of a preamp that has a wideband input. This page was last modified on 19 September 2017, at 18:37.